Choosing between Fujifilm X E2 and Sony a6000 can be quite difficult and tricky to some people, especially to the ones who also use their cameras not only to snap pictures but also to record videos. As for the moment, the two mirrorless digital cameras are available at roughly similar prices, though actually Sony a6000 is slightly pricier than Fujifilm X E2. Both products each has a considerable number of positive reviews from the users. Which one makes the bigger value for the money? Which one is better for you? Read on! Both mirrorless digital cameras have built-in Wi-Fi for easy and quick data transfer across devices. Each also has a built-in flash and an external flash shoe, so we can assume that they have the same edge in handling low light conditions. Each also has an electronic viewfinder, a feature that is very much beneficial for better framing and control over your images. Both have high-resolution display screens, and support continuous shooting as well as AE Bracketing. Unfortunately, neither has built-in image stabilization and neither is weatherproof. 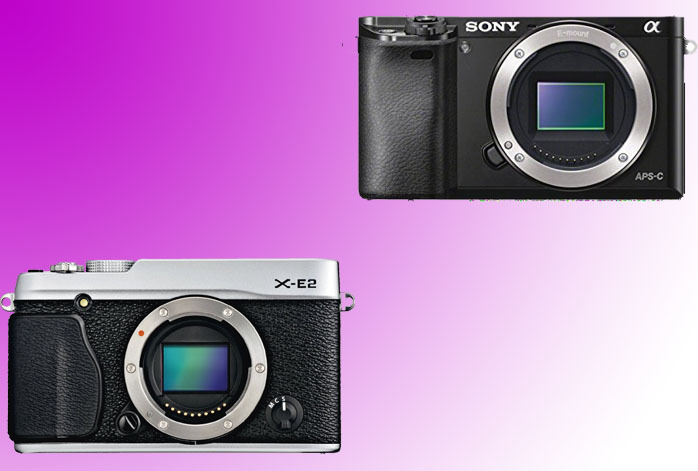 While Fujifilm X E2 and Sony a6000 share a lot of similarities in the features, they have quite different specifications. To begin with, Fujifilm X E2 is only armed with 16 MP image sensor with 49 focus points and 6,400 maximum ISO. On the other side, Sony a6000 boasts a 24 MP image sensor, 51,200 maximum ISO, and a very powerful and fast autofocus system with 179 focus points. As the effect, Sony a6000 can effortlessly generate much more sharpness and details into the images. For videos, both products have the same maximum resolution and frame rate. One thing, Fujifilm X E2 has an audio port that you can use for a microphone in order to capture high-quality sounds. Sony a6000 has no audio port. However, Sony a6000 once again wins over Fujifilm X E2 because it makes much better images in the videos. Fujifilm X E2 seem to struggle in cranking up the resolution due to the less powerful image sensor. If you are into sports photography, you certainly seek a strong camera with high shutter speed, great photo burst, and reliable buffer capacity. Fujifilm X E2 boasts a maximum shutter speed of 1/32,000s, but it only has 7 fps photo burst and a buffer capacity of 18 JPEG shots. On the other hand, Sony a6000 has a pretty standard maximum shutter speed of 1/4,000s, but boasts a whopping 11 fps photo burst and 47 JPEG shots maximum buffer. Last but not least, Sony a6000 has an AE Bracketing range of up to plus-minus 5EV, while Fujifilm X E2’s is limited to plus-minus 1EV. Certainly, Sony a6000 is able to capture much more accurate colors and details in HDR. As the conclusion, you should stick with Sony a6000. It has not only better image quality, but also better performance and versatility.